ALL SET: Dr Sue (seated second left) together with McClymont (seated far right), Lau (seated second right) and the team from Woodlands International School at the press conference. 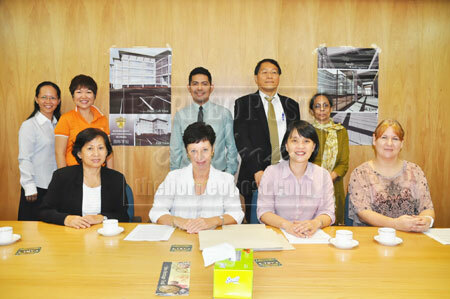 SIBU: Woodlands International School is due to open here next month. In a press statement, its chief operations officer Dr Sue Collins said qualified local and expatriate teachers from Australia, New Zealand, the UK and the Philippines had been recruited to provide a supportive, innovative and stimulating learning environment where every student was valued as a unique individual learner. Deputy chief executive officer Anne Lau, chief administrative officer and chief financial controller Dr Sii How Sing, principal Karen McClymont, kindergarten coordinator Sandhya Jain, primary school coordinator Christina Kok and secondary school coordinator Shiaw Kong Bong were also present when Dr Sue handed out the press statement to reporters. The staff members are currently participating in a two-week induction programme. Accredited by Cambridge, Woodlands will offer the internationally recognised gold standard Cambridge International Curriculum at both primary and secondary levels in addition to the exciting International Primary Curriculum (IPC) at kindergarten and primary levels. The medium of instruction at Woodlands will be English. The emphasis at Woodlands will be on the delivery of a well-rounded, holistic education. Class size will be limited to a maximum of 25 students. Full day kindergarten classes will be offered to children from three to five years of age. In response to request from parents, Woodlands is putting in place a half-day educational pre-kindergarten session for children born in 2010. The focus will be on the provision of rich development programme to prepare the children for the Year One Kindergarten class. The standard of Woodland’s facilities and resources will set a new benchmark of excellence in the region. Comprising 66 classrooms, the campus will be built in two phases, the fully air-conditioned facilities will include an IT suite with individual computers, a well stocked library, a large multi-purpose hall and a gymnasium, specialist teaching rooms for drama, language, music, art, fully equipped science laboratories, AV room, counselling facilities, outdoor sports facilities, two swimming pools including a purpose built pool for kindergarten children, a halal kitchen and dining hall. Two information sessions will be held this Saturday at Kingwood Hotel, with the first session from 2pm to 3pm to include general information regarding the ethos and vision of the school, registration procedures, fees, curriculum, uniform and selected school policies. The second session is from 3pm to 4.30pm. Meanwhile, the school will hold its open day for five days, April 8-12, from 9am till 4pm. Special orientation sessions for students and parents will be held at the school on April 10 at the following times: kindergarten (9am-10am), primary (10.30am-11.30am) and secondary (11.30am-12.30pm). Woodlands International School has been receiving a steady stream of applications from prospective students. To ensure the students’ individual learning needs will be catered to the highest international standards, entrance assessments are scheduled to be held from March 25 to 27 from 8am till noon at the United Association of Private Chinese Secondary School Boards of Management Sibu Division Sarawak. Interested parents are advised to contact the school to register their children and arrange for the entrance assessments. All enrolments received before April 15 enjoy a discount on assessment fee. Enquiries should be directed to [email protected] or call 016-8893513, 0168893537 or 019-8881621.